My husband and I both work full-time. Hence, finding the perfect work-life balance is not exactly easy. We’re always looking for ways to spend less time running around and more time with the kids. I recently got introduced to Blue Apron and wanted to share my opinions. 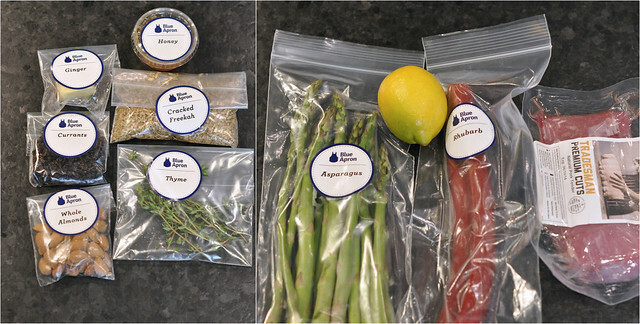 Blue Apron is a food delivery service based out of New York. 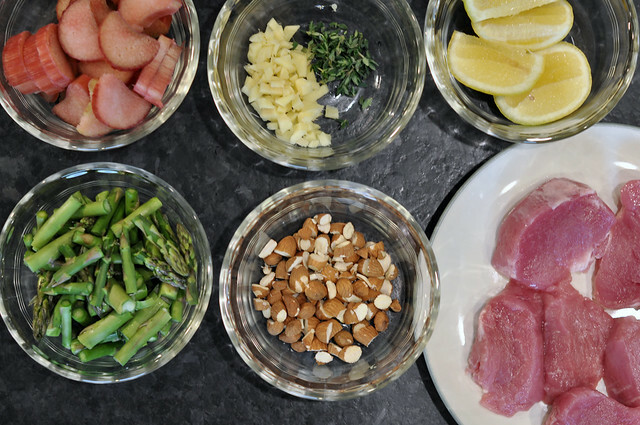 They delivery all the fresh ingredients you need to cook 3, 4 or 5 meals per week (depending on your weekly subscription) straight to your home. - You get to try new recipes every week. I am a creature of habit when it comes to food. Having different menus every week help us experience with a variety of food. Truth be told, I have never tried freekah in my life. We did end up liking it (probably way better than white rice). - While you get to try new things every week, you can totally adjust recipes to your own taste. For this particular recipe, we decided to skip the sauce because neither one of us is a fan of rhubard. I also grilled the pork instead of pan-fried as per instructions. Again, no oil = less calories = healthier choice. - For $10 per person, it's somewhat expensive for a home cooked meal. - You still have to spend time in the kitchen cooking. - The recipes were rather complicated (at least for me). Disclaimer: I was given credit to try out Blue Apron. All thoughts and opinions are 100% my own. Sydney, I commend your efforts in the kitchen! For the majority of my relationship, my now-husband was the chef, the maid, the taxi driver.. Poor guy! Now that we're family planning, I've taken the reign on cooking and cleaning (as I study for my boards).. and it's HARD! This service is a pretty good idea! Too bad I'm in Connecticut. Don't know how far up into tri-state they deliver! 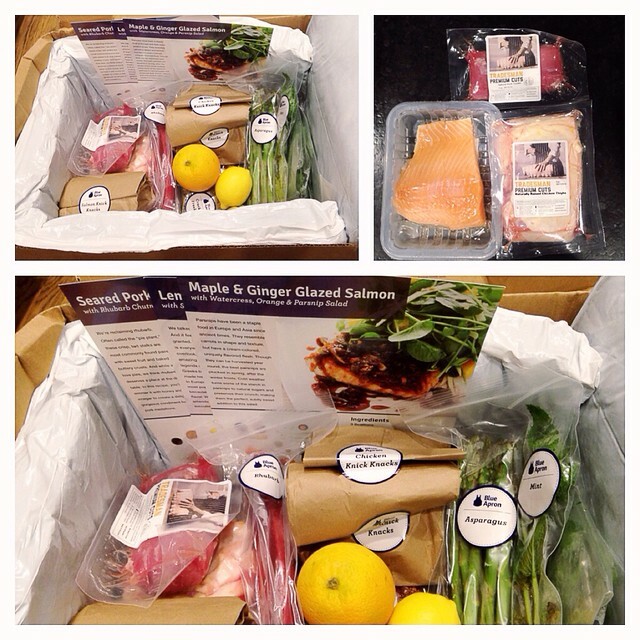 We also do Blueapron and love that it's fun, healthy, and takes the stress out of decision making and food shopping! It also makes us order out less! 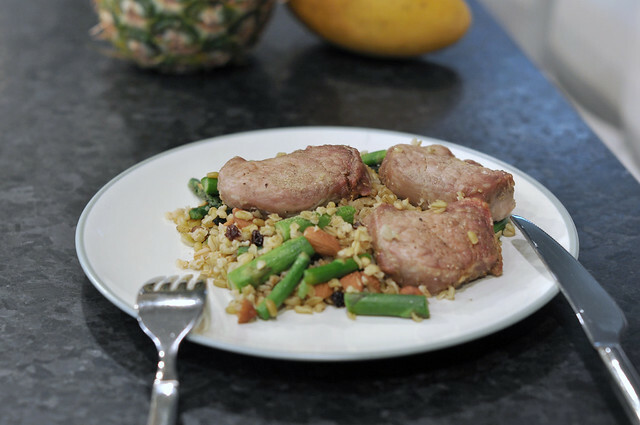 The pork medallions were soo yummy, especially with the rhubarb chutney- a mix of sweet and tart!